Children love good food and being outside, so make natural little foragers. Join us with your child to explore and sample some of autumn’s wild bounty, then finish up with roast chestnuts round the fire. Price: This experience is only available as a private booking – £100 for up to 4 children with a minimum of two accompanying adults ( only one adult need attend for 1-3 children). Larger groups can be catered for and will be priced at £100 for the first four children and £20 for every child beyond that number. The number of accompanying adults required will depend on group size. About Country Kids: The concept is simple – to allow parents and children an opportunity to experience a range of wholesome and engaging rural activities together under the guidance of an expert. The focus is on the children, with parents alongside to assist and join in the fun with their own kids. 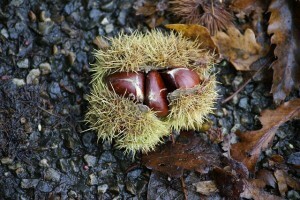 1 to 1 ½ hour foraging walk looking and sampling wild foods (where appropriate) and gathering chestnuts. Sitting round a camp fire eating roast chestnuts from the walk and drinking hot chocolate. This experience is only available as a private booking (please see price section of this page) – Please contact Michael to arrange a convenient date, the season is mid October – mid November. If you are interested in this children’s experience click here to contact us about booking or just for more information.